The Stork's Beak School of Historical Swordplay is based in Edinburgh, Scotland. The School is based on teaching, practice and research going back some 12 years. We currently offer regular courses of instruction in Longsword, Dussack, Two-Handed sword and the Great Stick or Bastone. We use steel replicas of historical weapons and teach systems, principles and techniques drawn from texts on the subject of fencing written between the fifteenth and nineteenth centuries. When you join our school, you will get to study the European tradition of martial arts, and learn how to use a variety of swords. And, in the process you may pick up some history, philosophy, and fitness. People mistakenly associate the words ‘martial arts’ exclusively with Asian fighting arts. Currently, there is a renaissance in the study of historically accurate Historical European Martial Arts, from medieval fighting treatises. These treatises reveal a well-established, highly sophisticated European fighting system, employing swords, rapiers, daggers, shields, pole axes, sickles and much more. Unfortunately, theatrical and popular media portrayals have reduced European martial arts to the myth that combatants merely crudely bludgeoned, hacked, and slashed savagely at their opponents. In reality, European martial arts integrate footwork, avoidance, bladework, and the ability to use timing and distance. These skills include techniques for grappling, wrestling, throwing, and disarming of the opponent. European martial arts are distinctly different from modern Olympic fencing and Asian martial arts. 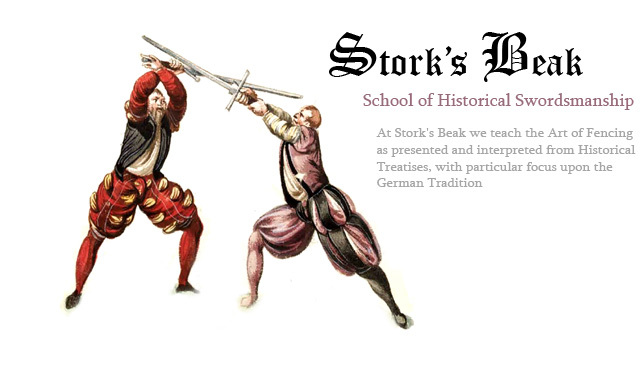 Aside from practising the physical and martial aspects of the Art of Fencing, Stork's Beak is also dedicated to continuing research into the historical martial arts. As such, we continue to develop interpretations based on period texts, work on translations of period manuscripts and encourage our students to pursue projects that will benefit the school and the community at large.